Acne is the most common skin condition as a disorder that affects the skin’s oil glands and hair follicles. We need to know the types of acne in order to take appropriate steps to control it. Whiteheads is comedones or pimples that stay closed under the surface of the skin, which result when the follicles get plugged from opening by sebum (natural oil) and dead skin cells. Our skin needs a certain amount of sebum (natural oil) to protect and nourish skin. But, excess sebum and dead skin cells can risk clogged pores. Don't be afraid, many of the medicines that treat blackheads are also effective against whiteheads. Blackheads are comedones or small bumps that are open at the surface of the skin, that occur when a pore is clogged by a combination of sebum, dead skin cells and trapped bacteria. The top of the pore stays open, despite the rest of it being clogged. This results in the characteristic black color seen on the surface. The dark color is caused by melanin in the skin reacting with oxygen. Blackheads are a mild type of acne tend to be rampant at the onset of puberty and during times of hormonal change that usually be found on the nose, chin, and forehead. But might also be found on the chest, back, and arms. Blackheads typically take a longer time to clear than whiteheads and can frequently be treated with over-the-counter medications. Papules are small, raised, solid pimples or comedones that don’t contain pus and forming small red or pink bumps on the skin and are usually the first type of inflammatory acne to affect the skin. This type of pimple may be sensitive to the touch. Picking or squeezing can make the inflammation worse and may lead to scarring. Pustules are the most common type of acne lesion, another kind of inflamed pimple. They resemble a whitehead and usually appear as an inflamed red circle with a center that is white or yellow. Pustules can also form when the walls around your pores break down. Unlike papules, pustules are filled with pus. Sufferers shouldn’t touch it with their bare hands and make sure that the material they are touching the skin with is sterile. Picking can cause scars or dark spots to develop on the skin. Acne medications may be more effective after the pustule has been popped. Nodules are large, inflamed bumps under the skin that feel firm to the touch and last for months. Nodules occur when clogged, swollen pores endure further irritation. Unlike pustules and papules, nodules are deeper underneath the skin and are often painful. 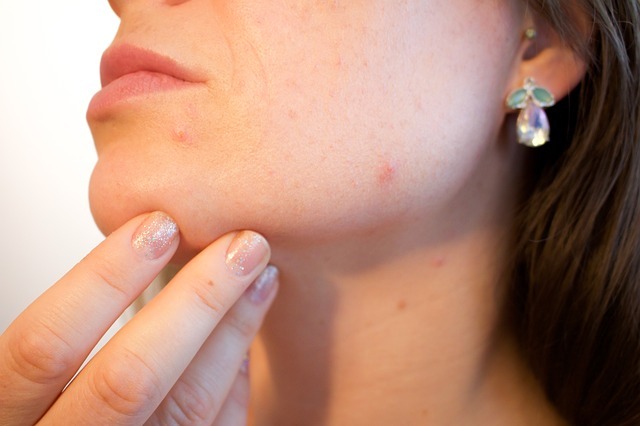 Scarring is a common side effect of nodular acne, over-the-counter treatments may not be powerful enough to clear them up, but prescription drugs can be effective, so it’s a good idea for anyone with nodular acne to visit a dermatologist for proper treatment. Cysts are the hardest types of acne to successfully treat and the largest form of acne further below the surface than nodules, pus-filled lesions that look similar to boils. Cysts can develop when pores are clogged by a combination of bacteria, sebum, dead skin cells and their formation usually results from a severe infection. They may just appear as a large, swollen, and red lump on the skin. They may occur independently, or you may find your skin has large clumps of cysts grouped together. This type of acne is also the most likely to scar. Inflammatory acne takes much longer to heal and can have permanent effects on the skin, so it’s important to determine the best treatment methods for your skin condition.